Gyles Brandreth has worked in the theatre for more than forty years as a writer, producer, director and actor. In the 1970s he was Artistic Director of the Oxford Theatre Festival where he produced plays by Bernard Shaw, Samuel Beckett, Benn Levy, William Douglas-Home and Dennis Cannan, starring Tom Baker, Ian Carmichael, Sinead Cusack, Charles Dance, Barbara Murray, Michael Redgrave, John Standing, Nigel Stock, John Stride and Moray Watson, among others, and from where The Dame of Sark starring Celia Johnson and Tony Britton, The Little Hut, starring Geraldine McEwan, James Villiers and Gerald Harper, and Dear Daddy, starring Nigel Patrick, transferred to the West End. As an actor he has appeared in pantomime (in Cinderella with Bonnie Langford, Barbara Windsor and Brian Conley), in Shakespeare (as Malvolio in a musical version of Twelfth Night and as the Ghost, Claudius and Polonius in Hamlet), and in the West End in his own award-winning celebration of musical theatre, Zipp! 100 Musicals in 100 Minutes or Your Money Back, and in his acclaimed one-man show, Looking for happiness. In the 1980s, for the BBC he scripted the TV series Dear Ladies with Dr Evadne Hinge and Dame Hilda Bracket and The Old Boy with Ned Sherrin for ITV. In 1986, with Julian Slade, the creator of Salad Days, he wrote Now We Are Sixty, a musical about the life and work of A A Milne, featuring the young Aled Jones as Christopher Robin. Now We Are Sixty had its London premiere at the King’s Head in Islington in 2013, in a new production by Martin Milnes, starring Andrew C Wadsworth, Charlotte Page and Russell Grant. Gyles Brandreth’s most recent work for the theatre is Wonderland, a play about Lewis Carroll and the actress Isa Bowman, first seen in Edinburgh in 2010, starring Michael Maloney and Flora Spencer-Longhurst, and directed by Iqbal Khan. Three actors. One play. Hamlet. This is Hamlet stripped to its core. Here the actors – three members of one real-life family: Gyles Brandreth, Benet Brandreth and Kosha Engler, father, son and wife – fix the spotlight on the myriad ways families make and unmake themselves. Hamlet is an epic drama with domestic tragedy at its heart. In this unexpected, thought-provoking production, a cast of three brings the confusion of family life sharply into focus. A family gathering, haunted, claustrophobic, intense. With a running time of 90 minutes, this is a Hamlet that blasts through our expectations of a familiar text offering a unique take on Shakespeare’s most famous play, performed by a unique cast. Directed by Simon Evans (Arturo Ui Donmar Warehouse, A Midsummer Night’s Dream Southwark Playhouse, The Dazzle and Bug Found 111), this is Hamlet stripped to its core and played by three members of one family: Gyles Brandreth, Benet Brandreth, Kosha Engler – father, son and wife. A family gathering, haunted, claustrophobic, intense. With a running time of 90 minutes, this Hamlet blasts through our expectations of a familiar text offering a unique take on Shakespeare’s most famous play, performed by a unique cast. "A truly fascinating and absorbing evening. I thought I knew Hamlet so well - but things happened last night that made me think again. Quite brilliant. And of course the whole family thing made one sweat all the more.” Jane McCulloch. Martin Milnes directs the London premiere of Gyles Brandreth and Julian Slade's NOW WE ARE SIXTY - a play with music exploring the life and works of AA Milne. Milne achieved immortal worldwide fame and fortune when he created the character of 'Winnie The Pooh' in stories written for his infant son, Christopher Robin. Yet the acclaim of those "four slim volumes" eclipsed the main legacy of the man who wrote plays, poetry and novels which delighted readers long before he started writing for children ... a fact that haunted the man whose humour and wit enchanted generations, but hid experiences of a much darker nature. Brandreth and Slade's affectionate tribute to AA Milne combines high farce with nostalgia and drama in a theatrical production which celebrates the genius behind an extremely private man in a public spotlight. Starring Olivier Nominee Andrew C Wadsworth (KISS ME, KATE) as AA Milne alongside West End star Charlotte Page (THE PHANTOM OF THE OPERA) and television favourite Russell Grant (STRICTLY COME DANCING) "Now We Are Sixty" is a unique theatrical event not to be missed. Bunbury Productions proudly present a brand-new musical of Oscar Wilde's classic comedy The Importance of Being Earnest. Often described as the most brilliant comedy in the English language, award-winning scriptwriter and lyricist Douglas Livingstone and composers Adam McGuinness and Zia Moranne have transported Wilde's farcical masterpiece from the 1890s to the 1920s and transformed it into a gloriously funny and memorable musical. Superbly directed by Iqbal Khan, it's a tale of confused identities and double-dealing, of a long-lost baby and newfound love - and a handbag. 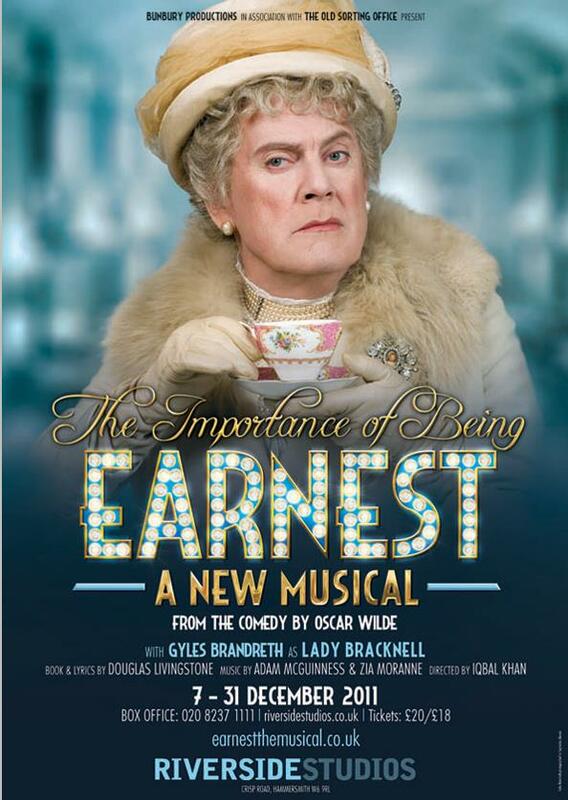 This new musical of Wilde's best-known play sees Gyles Brandreth leading a distinguished company in the role of Lady Bracknell. Gyles, a life-long Wilde enthusiast, was last seen in the West End in the award-winning musical revue Zipp! and at the Riverside Studios in his five-star-rated sell-out one-man show, earlier this year. Best known these days as a reporter on The One Show (BBC1), a regular on Just A Minute (Radio 4) and as the author of The Oscar Wilde Murder Mysteries (in which Wilde features as the detective), Gyles Brandreth is a former MP and Lord Commissioner of the Treasury, whose varied career has included playing Malvolio in Twelfth Night in Edinburgh in 2005 and Scrabble against a centenarian friend of Oscar Wilde's at school in 1963. The title of Brandreth's recently published diaries is Something Sensational to Read in the Train - a line taken from The Importance of Being Earnest. Iqbal Khan recently directed Arthur Miller's Broken Glass - starring Anthony Sher and Tara Fitzgerald - which received rave reviews and is currently working on The Killing Of Sister George starring Meera Syal, Helen Lederer and Belinda Lang. He will be directing Much Ado About Nothing for the RSC in 2012 with Meera Syal starring as Beatrice. Iqbal Khan worked with Gyles Brandreth last year on Wonderland, a play written by Gyles, about Lewis Carroll. Iqbal has worked extensively with musical productions, having directed Mozart's Don Giovanni, and having been awarded The Minack Trophy for Puccini's opera Madama Butterfly. He has his own history with the Wilde play as he directed The Importance of Being Earnest at The Union Chapel. Multi-award-winning writer and actor Douglas Livingstone has written numerous television plays, as well as the comedy series Born and Bred and Boys from the Bush. As well as contributing to such series as: Maigret, Shoulder to Shoulder and Midsomer Murders, his TV adaptations have included Clayhanger, Day of the Triffids, Wessex Tales and The Cazalets. His radio work includes the Sony award-winning Road to Rocio and, most recently, Road to Durham. Douglas' work has starred Michael Gambon, David Jason and John Thaw. Adam read music at London University during which time he became MD of the Barnes Youth Theatre. He was then appointed Head of Music at the Harrodian School and has since worked extensively as a session musician. Zia read music at Worcester College, Oxford and completed her studies at The Guildhall School Of Music and Drama where she was awarded the Edith Vogel Piano Prize. For the past 10 years, Adam and Zia have worked as freelance composers, writing, arranging and producing music not only for theatre and short films but also for companies such as Sky Sports, 3 Mobile and Eidos as well as the 2002 Commonwealth Games. This is a true story. What happens in the play happened in fact. The play is about two people: an older man and a young woman. who, as ‘Lewis Carroll’, wrote ‘Alice’s Adventures in Wonderland’ and ‘Through the Looking-Glass and What Alice Found There’, stories inspired by Dodgson’s friendship with Alice Liddell and her sisters, the daughters of Henry Liddell, Dean of Christ Church College, Oxford. All his adult life, Dodgson taught mathematics at Christ Church and for twenty-one years in succession took his summer holidays in Eastbourne. who, as a young actress, played ‘Alice in Wonderland’ in the theatre and, later, went on to become a popular star of music hall, stage and screen. During a long career, she appeared in everything from pantomime to Shakespeare, and made her last film, in Hollywood, in 1949. Charles Dodgson was born, during the reign of William IV, on 27 January 1832. He died, three years before the end of Queen Victoria’s reign, on 14 January 1898. His lifetime output was prodigious. He wrote stories, poems, books, pamphlets, academic works, by the score. He invented games and puzzles and magic tricks. He loved the theatre. He wrote letters (wonderful letters) by the thousand. He created some of the most memorable characters in English literature. He was a mathematical scholar of originality and distinction. He was a pioneer of portrait photography. He was a genius. Zipp! began as a show called Zip-a-dee-doo-dah!, directed by Stewart Nicholls at the Wimbledon Studio Theatre, and ended up in the West End in 2003 as Zipp! 100 Musicals in 100 Minutes or Your Money Back.